In March 1843 a messuage or dwelling house was to be sold by auction at Bate's Golden Lion Inn. Situated at the higher end of East Street, the property had a yard and enough stabling for 20 horses. The stabling could, suggested the advertisement, be converted into six dwellings. Details could be obtained from William Mann, auctioneer and land agent, East Street. Several people named William Mann were in Ashburton in the mid 1800s. The William above might be the 45 year old William Mann who was living in East Street in the 1851 census. Born in Ashburton, he was a butcher and auctioneer. William Mann, auctioneer, was elected to the guardians of the Newton Union in 1856. Particulars about the White Hart Inn, Newton Abbot, which was to be let in 1859, could be had from Wm Mann, auctioneer and land agent, East Street, Ashburton. In 1862 a middle-aged man was seeking employment as a farm bailiff. Prospective employers were to contact Messrs Mann and son, auctioneers and land agents. James Creagh, the son of Henry Couch and Mary Caroline Creagh, was privately baptized in August 1828. Henry was described as a land surveyor. James died aged 14 days. Mr H C Creagh, house and land agent, was advertising a property to let 'in the best part' of Ashburton in 1849. It would be particularly suitable for a professional gentleman. Henry Couch Creach, land survetyor, was elected to the guardians of the Newton Union in 1856. 61 year old Henry Couch Creagh was living at Staverton Place in 1851. A land surveyor and auctioneer, he had been born in East Stonehouse, Devon. With him on the census was his wife and 6 children, with the four youngest having been born in Ashburton. The Town and Manor mills, a flour mill currently run by Mr Stephen Yolland, was to be let in 1851. The mills had only been built a few years before, and included a 22 foot high water wheel driven by the river Yeo. A rich watered meadow, dwelling house and outbuildings were included in the lease. Mr W R Whiteway, land agent, was the proprietor. 42 year old William R Whiteway, his wife Elizth and son William R were in Kingsbridge Lane in 1851. William snr., a land agent, maltster and seedsman, had been born in Chudleigh. In 1852 the dwelling-house of Miss Eales, deceased, in West Street was to be let. The house had a breakfast room, dining room, drawing room and sitting room, plus 7 bedrooms, dressing room and closets etc. There was a kitchen, two pantries,cellar, washhouse, coal-house and well-stocked garden. Those interested could apply to Mr W Rolstone Whiteway, land agent. W R Whiteway was described as a maltster and land agent when he took John Foaden to court in 1855. The dispute centred on who was responsible for paying for malt supplied to the Sun Inn by Whiteway. * Judgment was given to the defendant. 1858. Mr W R Whiteway, 'land agent etc.' was advertising seed from 10s to 30s an acre, suitable for lawns, orchards, pasture and parks. He also had 'excellent mangold wurtzel seed'. A brick built 10 room house was to let in Ashburton in 1865, in 'a healthy and pleasant part of the town'. Applications could be made to Messrs. Whiteway and Foot, land agents, Ashburton. In the 1871 census William Foot was with his father-in-law William R Whiteway, in East Street. With him was his wife Susanna R and three children. William Foot was a land agent. William Rolstone Whiteway was 75 when he died in July 1884. A churchwarden, he was of Orley (?) House, Ashburton. In 1889 George C Foot, of Whiteway and Foot, Ashburton, was appointed as a bailiff for levying distresses*. Edwd, The son of William and Elizabeth Sawdy, was baptised in June 1815. The family lived at Summer Hill, Ashburton, and William was a yeoman. In January 1818 Elizabeth Sawdye, aged 30, was buried in North Bovey; she was of Summerhill, in Ashburton. Her death was followed in February by that of Mary Sawdye, aged 10, and then William, aged 5, both of the same address. In June 1843 a factory, mill and dwelling houses in Buckfastleigh were for sale. Mr E Sawdye was to conduct the auction at the London Inn, Ashburton. Fields in Shaldon were being sold in 1844. Prospective purchasers could apply to Mr William Sawdye, Land Surveyor, Ashburton, and to Mr Edward Sawdye, auctioneer. By the time of the 1851 census Edward and Rebecca were living in West Street with two sons, William and Edward J., and two daughters. 36 year old Edward was a surveyor, auctioneer and land agent, and the entire family had been born in Ashburton. Edward John, unmarried, the son of Edward and Rebecca, was with his parents in 1871. Aged 20, he was a surveyor and auctioneer's clerk. Also in the household was 7 year old William E Sawdye, who had been born in London. William Sawdye married Rebecca Ann Palk in the September quarter of 1862, in Lambeth. William Edward Sawdye, the son of William and Rebecca Ann, was baptised in Ashburton in December 1864. His father was a mercantile clerk. A note in the register says that William Edward was born on November 14th, 1863. Edward snr. was a widower in the 1891 census, and at 76 and according to the census was still a surveyor and land agent. His 27 year old grandson, William E Sawdye, was in his household, and was an auctioneer's clerk. William had been born in Peckham, London. Edward Sawdye died in August 1898, aged 83. Head of the Sawdye and Son, he had been infirm for some time, but during his lifetime 'had filled most of the borough offices'. He had been a churchwarden, and had been one of the original members of the Ashburton Lodge of Oddfellows, established in 1845. 30 year old Edward J Sawdye was living in East Street in 1881. With him on the census was his wife Sarah E., his daughter Elizabeth M., and his son Edward. The family, with the addition of son John P., were still in East Street in 1891, at the Golden Lion Hotel. Edward was an auctioneer and hotel keeper. Edward jnr.was the only child of Edward J and Sarah E to be with his parents in the 1901 census. He was an auctioneer, surveyor and valuer, and was a partner in the business. The family was still at the Golden Lion. Left: A letter from E Jno. 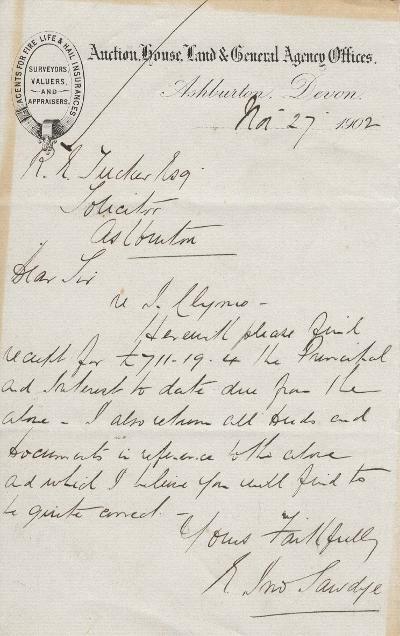 Sawdye to R E Tucker Esq., solicitor, dated 27 November,1902. The letter is headed Auction House, Land and General Agency Offices. The firm is also Surveyors, Valuers and Appraisers, and agent for 'Fire Life and Hail insurances'*. By 1902 Kelly's Directory showed James Clymo as the proprietor of the Golden Lion Family and Commercial hotel and posting house. In 1907 the amalgamation was announced of Rendell and Symons with Sawdye and Son. The business was to be carried on in the name of Rendell and Sawdye, with offices in Ashburton, Totnes, and Newton Abbot. Particulars for Thornecroft, Landscove, which was for sale in December 1908, could be had from Rendell and Sawdye, land agents, Ashburton. A headline in the Gloucester Citizen in 1943 announced: 'Nurse, now war-time auctioneer'. The newspaper thought that Mrs J J Sawdye, of Ashburton, was probably the first woman in the country 'to combine the two jobs of auctioneer and nurse'. Mrs Sawdye's husband and all his staff had been called up for the war, but Mrs Sawdye continued to run the business, selling poultry, property and furniture. When not in the office she worked in a nursing home. Sawdye and Harris, land agents, were selling a farm within easy reach of Newton Abbot in October 1946. By 1949 Sawdye and Harris were holding a monthly auction at Newton Abbot market. The Sawdye part of the partnership was J A Sawdye, FALPA, and Harris was C H Harris, FAI, FVI. The company described itself as live stock and general auctioneers, land agents, surveyors and valuers. In 1901 William Ford, land agent of Ashburton, was summoned by Stephen William Yolland for trepass in pursuit of game. During the case it was stated that although the men were neighbours they were not on neighbourly terms. The Bench fined Mr Ford 16s.